I had an email from a blog reader about the Nevada primrose, and during correspondence, found out the writer had written several books. 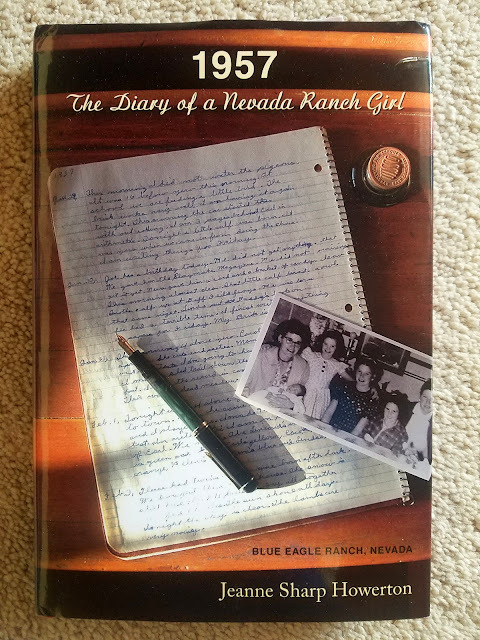 I bought a copy of 1957: The Diary of a Nevada Ranch Girl and was quickly immersed. Jeanne Sharp (Howerton) was nine years old when she started her diary on January 1, 1957. She had gotten the diary as a Christmas present and watched as her father wrote in his diary every night. Inspired, she wrote every day about her life on a rural ranch about 60 miles from Ely, Nevada in Railroad Valley. She wrote about her chores, hobbies (raising parakeets was one), going to school (in a one-room school house where her mother taught), games she and her sisters played, her father's travels for Nevada Farm Bureau, visitors, and holidays. She also mentioned the atomic testing that was taking place on the other side of the mountain range from them on the Nevada Test Site. Decades later, she went back to that diary and decided to publish it, with explanations of what she took for granted then. The book is a fascinating look at rural life during the 1950s. In some ways it was what I expected, but in others it surprised me. It's a quick and fun read. When I finished it, I gave it to Desert Girl (yesterday, on the seventh day of Christmas). She read a little and decided she wanted to start her own diary. She made her first entry today, on January 1. Here's hoping she keeps it up and in a few decades can go back to it and be reminded of how she lived as a Nevada Ranch Girl. Limited copies are available from Amazon. I'm hoping more are out there, this book is great! And here's an article about Jeanne's mother in the Las Vegas Review Journal. She lived to age 98 1/2 (Ely Times obituary).